Doodle madness. - Transylvanian wannabe ninja - since 1756. I've already started another Kag/Sess piece, only a few hours after I've finished the first one. The way this is shaping up it will be a page in a (hopefully short) doujinshi. His eyes are SO pretty. I wish to enable encourage this recent bout of painting, as it makes me happy. Well, it makes me happy too! For a while I thought I'd never draw again (which was of course frightfully stupid of me). None can escape once he's given them that look. Thanks! I don't know how detailed this is going to become, but I'll try to keep it pretty. Your Sessomaru (sp?) is damn beautiful. I liked the first pic too. I'm looking forward to more. The eyes are amazing. I think he was actually asking Kagome, but I'm sure he doesn't mind if you join them. The more the merrier, after all! Jedi!Sesshoumaru... *suddenly finds self naked* What the?! Pfft...now that you've added the Jedi mind meld comment, I can't look at it without hearing Obi Wan. As if he really needed magic mind powers to get the nookie. I would be jealous but I'm too praiseful of your work to be jealous...Haha its so beautiful! 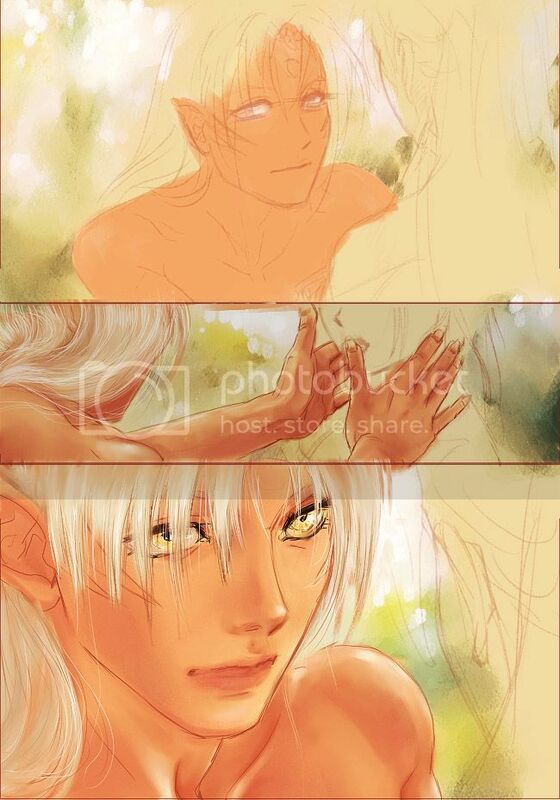 I love the way Sesshoumaru seems to almost be smiling in the first one and how he is reaching out to touch (Kagome's?) face...Very romantic sweet gesture or so it looks. I cannot wait until you add more to it! Hee! That's absolutely gorgeous, especially Sesshoumaru's eyes in the last panel. BTW, were you working on your layout yesterday? I kept getting errors where half the page wouldn't load.